First appearance "Rowdy Roddy's Rotten Pipes"
Roderick George Toombs (April 17, 1954 – July 30, 2015), better known as Rowdy Roddy Piper, or just Roddy, was a short-tempered wrestler of Scottish descent. Because of his heritage, he proudly wears a kilt and enjoys playing his bagpipes. His only appearance in the Mario franchise is in The Super Mario Bros. Super Show! live-action segment "Rowdy Roddy's Rotten Pipes". At some point, Roddy drops off his bagpipes with Luigi at Mario Brothers Plumbing, asking for Luigi to repair them. Despite the fact that plumbers do not usually repair bagpipes, Luigi is afraid to say no to a tough guy like Roddy, and accepts his business. Roddy returns to Mario Brothers Plumbing, and is improperly greeted by Mario, who at first mistakes him for a hairy lady wearing a plaid skirt. Roddy then yells at Mario and introduces himself, but Mario tries to tell him that he should not be wearing a skirt in the streets of Brooklyn. Upon hearing this remark, Roddy hisses at Mario. Roddy makes it clear to Mario and Luigi that his bagpipes are an antique family heirloom, only to discover that they have been converted into a vacuum cleaner by Mario. Luigi tries to pass off the vacuum cleaner as a one-of-a-kind Scottish import from the McBronx Vacuum Company, but Roddy has a hard time believing his story, and asks for him to turn it on. As soon as Luigi does so, the vacuum cleaner starts to play bagpipe music, and shoots Roddy in the face with a puff of dust. Roddy proceeded to wash off his face with a washcloth at the kitchen sink, while Mario and Luigi scramble to fix his bagpipes. In an attempt to buy themselves some more time from Roddy, Mario puts on an opera tape, only because he and Luigi do not own any bagpipe music on tape, which had been Luigi's actual suggestion. Roddy, however, enjoys the opera music, laughs, and asked for a fresh washcloth. After receiving a new one from Mario, Roddy continues to wash his face, stating that he hates it when people mess him over. After discovering that the washcloth Mario gave him was filthy due to the skid marks it left on his face, he yells at Mario and Luigi, and proceeds to hiss at them. 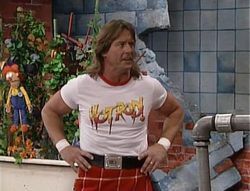 After Roddy cleans off his face, he yells at Mario and Luigi again, explaining that he needs his bagpipes to play the Scottish national anthem for a fight at Madison Square Garden that night. Mario jokes to Roddy that if he wears his "skirt" to Madison Square garden, he will start a fight. Just as Roddy hisses back at him, Luigi announces that the bagpipes are fixed. Roddy points out that they are still attached to part of the vacuum cleaner, but Luigi assured him not to worry and plugs it in, causing bagpipe music to play automatically. Thrilled that his bagpipes are working better than ever, Roddy screams, then hugs Mario and Luigi, who are afraid that Roddy is going to hurt them. This page was last edited on October 10, 2018, at 22:10.